We report on the combined action of a cw diode laser and a train of ultrashort pulses when each of them drives one step of the 5S-5P-5D two-photon transition in rubidium vapor. 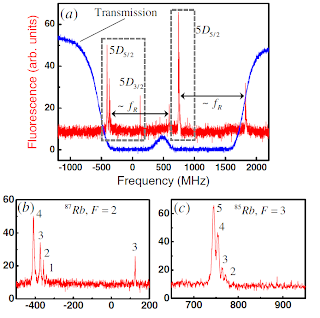 The fluorescence from the 6P3∕2 state is detected for a fixed repetition rate of the femtosecond laser while the cw-laser frequency is scanned over the rubidium D2 lines. This scheme allows for a velocity selective spectroscopy in a large spectral range including the 5D3∕2 and 5D5∕2 states. The results are well described in a simplified frequency domain picture, considering the interaction of each velocity group with the cw laser and a single mode of the frequency comb. In recent years, advances in ultrafast lasers and related optical technologies have enhanced the ability to control the interaction between light and matter . In particular, the application of mode-locked lasers for high-resolution precision spectroscopy has been explored using fully stabilized optical frequency combs , as a direct probe of atomic transitions . By incorporating pulse shaping technology, a precise control of molecular dynamics has also been demonstrated . For experiments along these lines focused on twophoton transitions, a cooled and trapped sample is usually employed, such that only one group of atoms is investigated as the fs laser repetition rate is scanned [4,5]. For atomic systems with considerable Doppler broadening, excitations to different states have been isolated by applying narrowband interference filters in the exciting-lasers pathways [6,7]. In this context, the introduction of a second, cw laser opens new directions of investigation, with the narrowband laser assuming the role of a velocity-selective filter. In the case of onephoton transitions, velocity-selective spectroscopy has already been performed , and distinction between different hyperfine levels within the Doppler profile has been demonstrated . 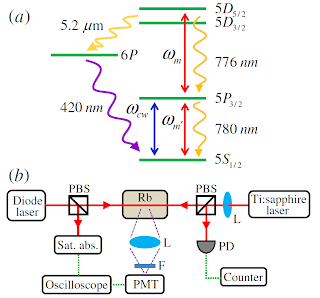 Here, the scheme with a second, cw laser is applied to investigate two-photon transitions, achieving considerably improved spectral resolution when compared to the previously reported works on velocityselective spectroscopy with frequency combs [8,9]. We employ a diode laser and a 1 GHz Ti:sapphire laser to excite each step of the 5S-5P-5D two-photon transition in a rubidium vapor (Fig. 1). 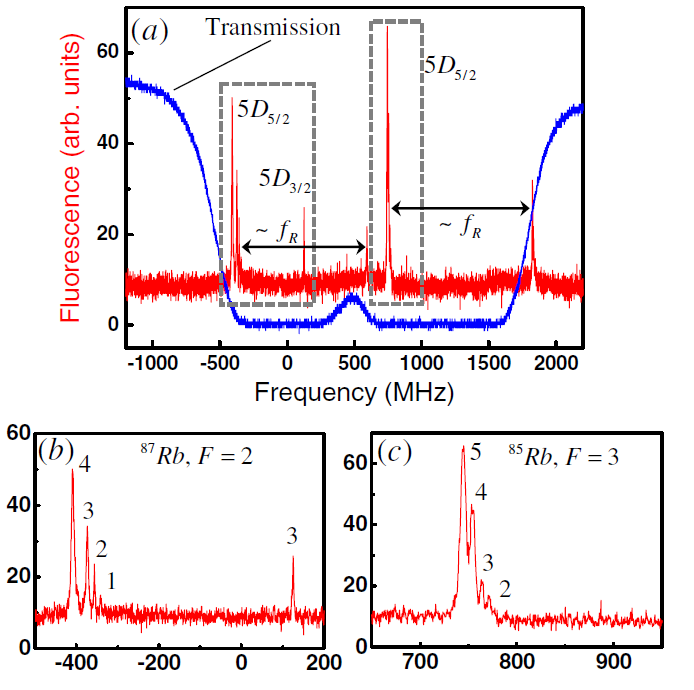 The fluorescence of the 6P3∕2 state is detected for a fixed repetition rate of the femtosecond (fs) laser as a function of the diode frequency. This scheme allows us to perform a velocity-selective spectroscopy and investigate, simultaneously, the hyperfine levels 5D3∕2 and 5D5∕2. Under the high repetition rate of the fs laser, the necessary condition for the accumulation of population and coherence is easily fulfilled, and a good description of the results is obtained considering a threelevelcascade system interacting with two cw lasers. A simplified scheme of the experimental setup together with the relevant energy levels is presented in Fig. 1. A diode laser, stabilized in temperature and with a linewidth of about 1 MHz, is used to excite the 5S1∕2 → 5P3∕2 transition at 780 nm. 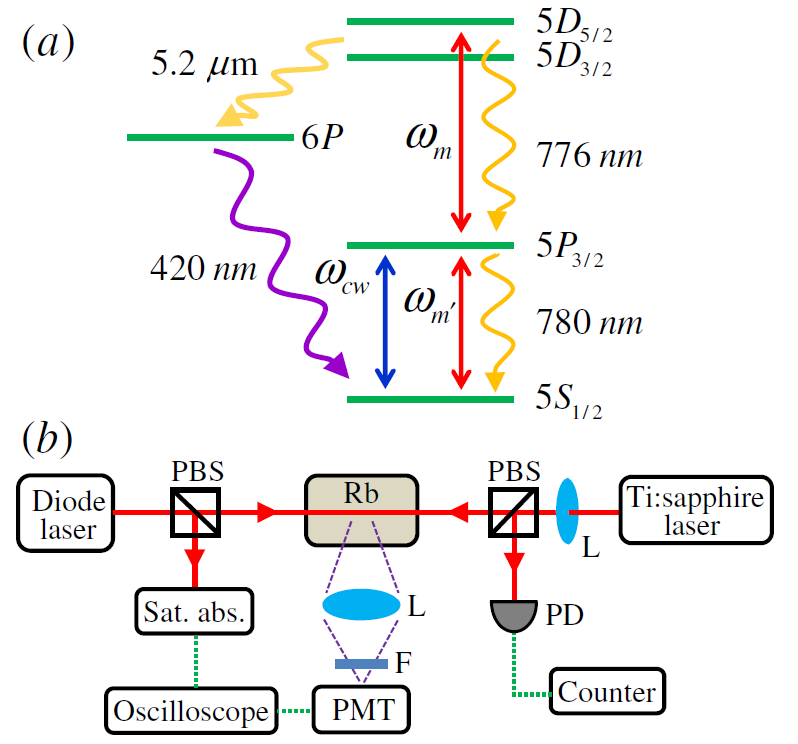 A train of fs pulses generated by a mode-locked Ti:sapphire laser (BR Labs Ltda) can excite both 5S1∕2 → 5P3∕2 and 5P3∕2 → 5D transitions. The two beams are overlapped, with orthogonal linear polarizations and in a counter propagating configuration, in the center of a sealed Rb vapor cell. The vapor cell is heated to ≈ 80°C and contains both Rb 85 and Rb 87 isotopes in their natural abundances. The Ti:sapphire laser produces 100 fs pulses, with 300 mW of average power and a bandwidth of 20 nm, corresponding to ≈ 104 modes. The f R 1 GHz repetition rate is measured with a photodiode and phase locked to a signal generator (E8663B-Agilent), with 1 Hz resolution, while the carrier-envelope-offset frequency, fo, is left free. The diode laser can sweep over 10 GHz by tuning its injection current, and a saturated absorption setup is used to calibrate its frequency. A direct detection of the diode-beam transmission after passing through the cell gives information about the absorption in the 5S → 5P transition. Fig. 1. (a) Schematic representation of the energy levels of Rb, where ωcw represents the diode frequency and ωm and ωm0 are two distinct modes of the frequency comb. (b) Experimental setup. The components are the following: PBS, polarizing beam splitter (rejection rate > 103); PMT, photomultiplier tube; PD, photodetector; L, lens; F, filter. The fluorescence at 420 nm emitted by spontaneous decay from 6P state to 5S is collected at 90°, using a 10 cm focal lens and a filter to cut the scattered light from the excitation laser beams. The signal is detected with a photomultiplier tube and recorded on a digital oscilloscope. Figure 2 shows the fluorescence signal (lower curve), for a fixed fR, as the diode frequency is scanned over the four Doppler-broadened D2 lines of the Rb 85 and Rb 87. The spectrum consists of several narrow peaks over a flat background. The narrow peaks are due to the two-photon transition excited by both lasers—the diode laser and the different modes of the frequency comb; while the background is due only to excitation by the frequency comb. 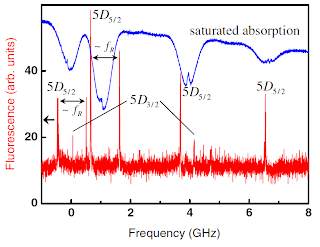 In the same scan, we can observe, simultaneously, peaks associated to the excitation of the 5D3∕2 and 5D5∕2 states. We also see two peaks, separated by one fR in optical frequency of the diode laser, that correspond to the same transition excited by two neighboring modes of the frequency comb. The saturated absorption curve (upper curve) is used to calibrate the diode frequency. The fluorescence for the Doppler lines F = 2 of Rb 87 and F = 3 of Rb 85, as a function of the diode frequency, is shown in Fig. 3, for a slow scan in a shorter range of frequency and a different fR value. We also present a measurement of the direct transmission of the diode beam after passing through the warm cell (blue curve), indicating the strong absorption in the center of the Doppler lines. Figures 3(b) and 3(c) display a zoom of the two frequency regions selected in Fig. 3(a). As we can see, each peak in Fig. 2 consists of a group of peaks, which are the result of excitation from a given ground-state hyperfine level to all the hyperfine levels (F'') of the excited state. To identify each line in Fig. 3 we use the two-photon resonance condition, combined with the position of the peak in the Doppler profile (which determines the velocity of the atoms that are resonant with both lasers) and the repetition frequency of the fs laser. Each line is the contribution of excitation through various hyperfine levels (F') of the intermediate state . We can understand and calculate such spectra using a simple model consisting of independent three-level cascade systems interacting with two cw lasers. As we are interested in the combined action of the diode and the fs lasers, we will neglect the background. We denote one of the hyperfine levels of the ground 5S1∕2; F, intermediate 5P3∕2; F', and final 5D; F'' states as 1, 2, and 3, respectively. The train of ultrashort pulses is described in the frequency domain as a frequency comb and we take into account only the modes that are near resonance with the 2 → 3 transitions. We also consider that the transitions 1→ 2 are only driven by the diode laser. As the diode beam may be intense, we cannot apply secondorder time-dependent perturbation theory, as in . The calculations are performed from the full Bloch equations for a three-level cascade system. The 1 → 2 transitions may be open or closed, depending on which F' is being excited. However, due to the longer lifetimes of the 5D states (resulting in weaker optical pumping) and to simplify the calculations, we consider that the 2 → 3 transitions are always closed. with ΔD being the inhomogeneous Doppler linewidth. In the calculations, the strength of a specific Fi → Fj transition is parametrized by the corresponding Rabi frequency: ΩFi;Fj μFi;FjE ∕ℏ, where μFi;Fj is the electric-dipole moment for the transition and in the direction of the electric field, whose amplitude E may refer to the diode laser or a single mode of the frequency comb, depending on the transition. To compare with the experimental spectra, we need to add the contributions due to all allowed two-photon transitions: ρcalc. We consider that the two beams have orthogonal polarizations and sum all contributions weighted by the corresponding eletric dipole moments. We also take into account that more than one velocity group contributes to the fluorescence from each two-photon transition [6,10]. Figure 4 shows the calculated population ρ33(δ) of level 3 for four different groups of peaks at each of the D2 Doppler lines. At the right column of Fig. 4 we display the experimental results obtained for the same conditions used in the calculations. As we can see, a good description of the experimental results is obtained, although the peaks appear wider than the calculated ones. We attribute the larger widths of the experimental peaks mainly to the linewidth of the diode laser itself, the jitter of the offset frequency, and contributions of the magnetic field broadening. at 420 nm, as a function of the diode frequency, for the four D2 Doppler lines. In conclusion, we show that the combined action of a cw laser and a train of ultrashort pulses can be used to drive two-photon transitions efficiently and with high spectral resolution. Although the experimental resolution is limited by the free-running offset frequency and the linewidth of the diode laser, we are able to investigate simultaneously a large spectral range including the 5D3∕2 and 5D5∕2 states with good spectral resolution, and without the need of direct spectral filtering of the fs laser. 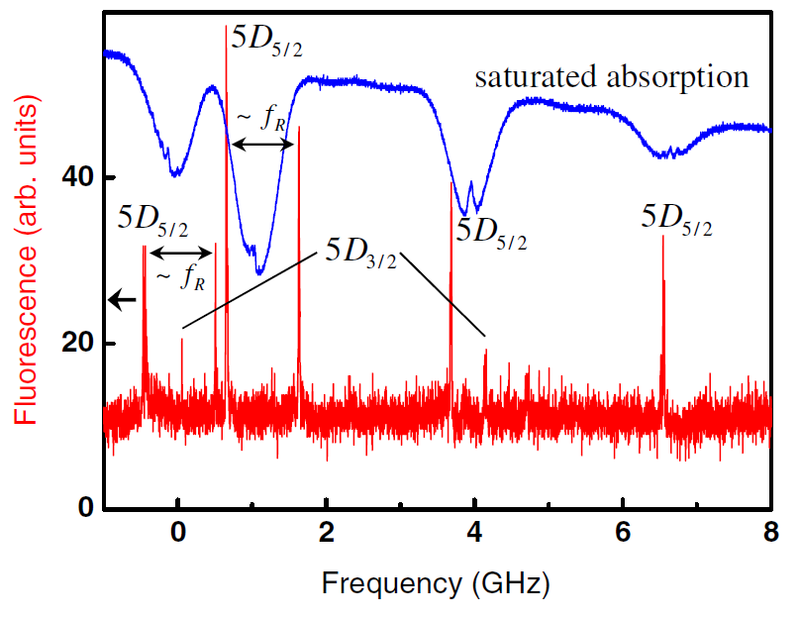 A direct, quantitative description of the experimental spectra is given in the frequency domain picture, highlighting all physical elements that are important to explain our results. This work was supported by CNPq, FACEPE, and CAPES (Brazilian Agencies).